Deep pressure can quickly help calm an anxious or overstimulated child without a lot of planning or equipment! What’s the first thing new moms and dads do when their newborn is crying and can’t be comforted? They wrap them up tight in a swaddle blanket! Of course, there are a handful of other calming sensory strategies we use with babies too – rocking, shushing, bouncing, etc. But swaddling is a tried and true trick that many families use to calm their babies. What’s the big deal with swaddling? Why does it work so well for so many kids? Two words…deep pressure. Why is Deep Pressure Calming? Many kids (and adults) find deep pressure input to be calming and relaxing. This is part of the reason that a massage feels so good when we’ve been stressed out. It’s why we see many kids who have difficulty with self-regulation and sensory processing respond positively to tools and activities that involve deep pressure (e.g. weighted blankets, squishes with a cushion, bear hugs). Deep pressure has been found to impact the autonomic nervous system (ANS), the part of the nervous system that regulates breathing, heart rate, and many other functions of the body. There are two divisions of the ANS – the sympathetic and parasympathetic nervous systems (SNS and PSNS). The SNS is commonly characterized by the fight-or-flight response, and is the quick-responding part of the ANS. The PSNS is thought of as a dampening or inhibitory system. Deep pressure is believed to provide tactile and proprioceptive input to the body that can modulate the activity of the PSNS and SNS, bringing the systems into more of a balanced response and state of arousal. Light touch is often perceived as alerting and even agitating to some people, while deep pressure touch is typically calming and organizing to the sensory systems. Who Benefits From Deep Pressure? 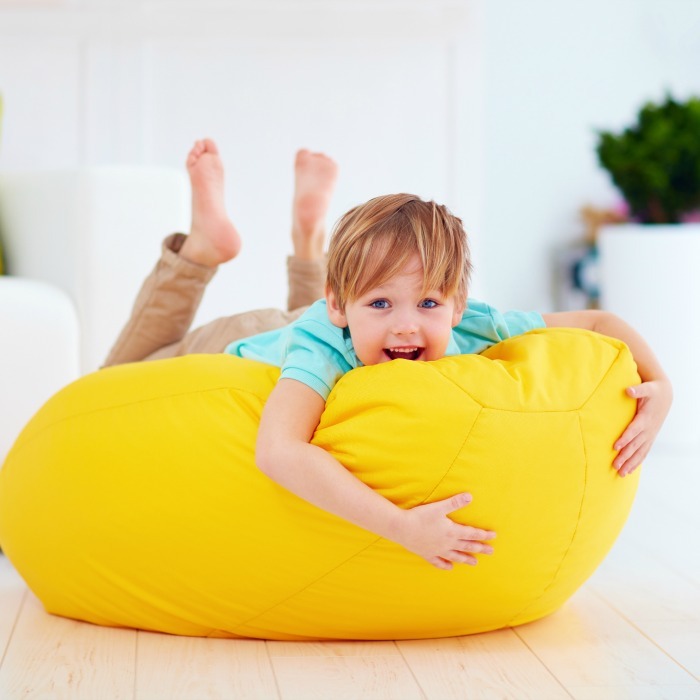 While every child is different and has his or her own preferences, I consider deep pressure to be my go-to calming sensory strategy at home and at work. Whether I’m working with a child who is overstimulated and can’t sit still or I’m dealing with a tantrum with one of my own kids at home, the first thing I find myself doing is getting down to their level, taking their hands, and applying deep pressure as I talk quietly to them. 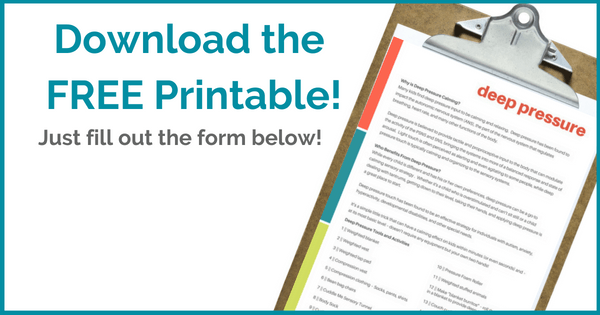 Deep pressure touch has been found to be an effective strategy for individuals with autism, anxiety, hyperactivity, developmental disabilities, and other special needs. It’s a simple little trick that can have a calming effect on kids within minutes (or even seconds) and – at its most basic level – doesn’t require any equipment but your own two hands! Of course, the easiest way to provide deep pressure is to use your hands to massage or give “squeezes” to a child who needs some help regulating his body. 1 || Weighted blanket – Check out these blankets from Harkla – they’re super soft and provide a subtle amount of weight and pressure – perfect for calming little bodies! 20 || Make “blanket burritos” – roll the child up in a blanket to provide deep pressure! Deep pressure isn’t the answer for calming every single child because every child has his own unique sensory makeup. And deep pressure isn’t the only calming sensory strategy out there – far from it! 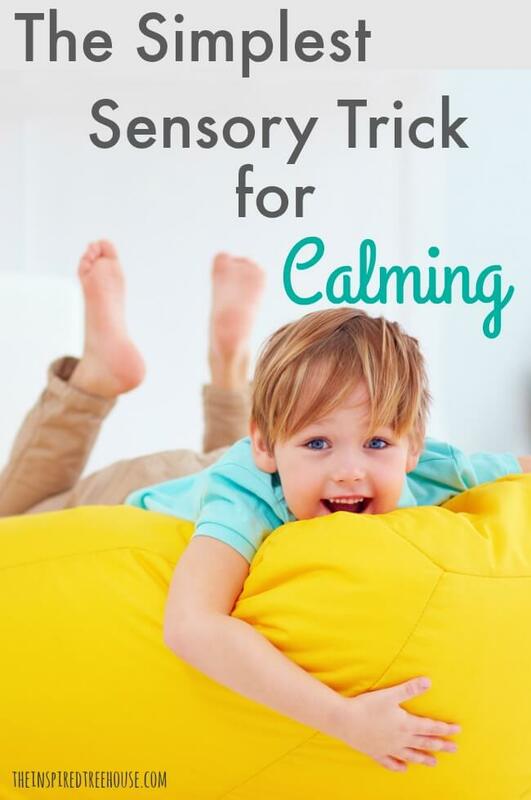 Check out these calming sensory strategies for more ideas! Be sure to take a peek at our DIY Calm Down Kit and these awesome ideas for Calm Kids on the Go: Sensory Strategies for Outings. I couldn’t agree more. Often we tend to try and get kids to conform and yet, many are stressed and anxious trying to cope and adapt to a challenging world. A little deep pressure goes a long way in off-setting an overactive fight/fright/flight response system trying to protect a brain that is not working right. Thank you for sharing!